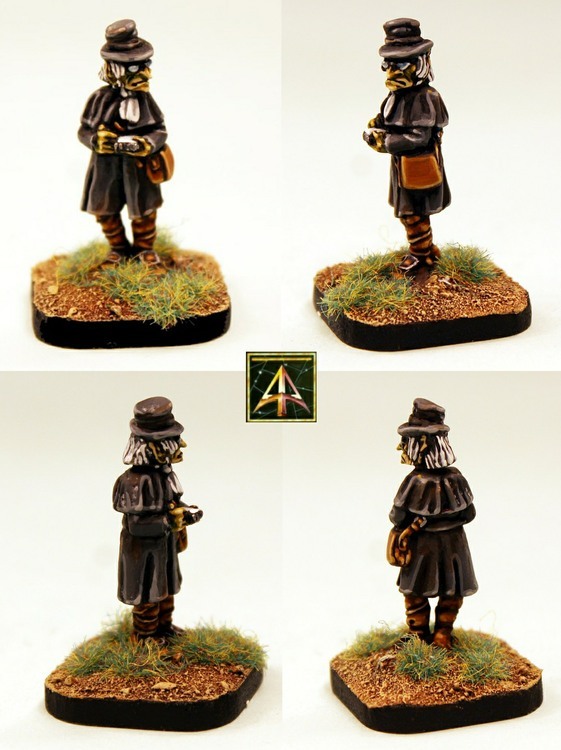 Two new 28mm releases from Alternative Armies for the World of Valon and the game systems Flintloque and Slaughterloo. Both miniatures are characters who also have a free digital download with game rules and more on our website. Go HERE for the Miser and HERE for the Aristo or read on for more. These follow up on the recent free Flintloque four page resource for playing Othari in the game which you can find HERE for free download. Coins don’t fall from the sky. Coins come from those not willing to give them and they try to escape your grasp as quickly as they can; as if it were fabled Wylde Magicke. Keeping the count straight falls to those in the commissariat, to those in the back room with the thick leather purses and those in secure rooms with guards outside. Who keeps the count straight? What kind of being is taken on byMagnates, by Generals, by Kings? A special breed known as the ‘Miser’. A miser never spends any coins. Not those of his employer nor those of his own. This makes him excellent for seeking out the breaches and drains where coins leak away. In the Army of Albion and the great counting houses of Londinium there is a shortage of Gnomes so the misers are on the whole Hob Goblins from Taffsea and Ratmen from Joccia. Coming from the cobbles streets where murder, starvation and robbery are commonplace a miser who survives that upbringing develops an almost supernatural sense to where money can be found. 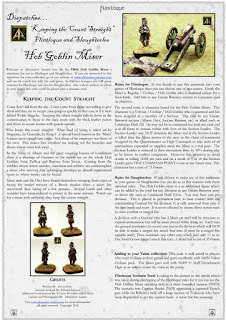 Many rank and file Orcs have found themselves swinging from ropes or facing the tender mercies of a Bessie musket when a miser has uncovered their taking of a few pennies. Several Lords and other notables have been reduced to penury in the same manner. Watch out for a miser with authority..they keep the counts straight. This code contains one 28mm scale white metal miniature which stands about 28mm tall. A civilian in long coat and hat with pad and pencil to keep the count. This miniature works well in many game systems in High Fantasy and of course Flintloque and Slaughterloo. Goes excellently with the Orcs of Albion plus Valon Civilians. You can purchase this code unpainted or painted and based for immediate play. Supplied with a 25mm square base. Price 2.00GBP. Go HERE. We have created a one page article called 'Keeping the Count Straight' which contains a short tale, rules for Flintloque, rules for Slaughterloo as well as a scenario seed which is hosted on our website as a PDF; click HERE to download it to your device. Enjoy. The ailing Otharmann Empyre is an exotic and semi magicke place which is filled with contrasts. From the rich bazaars and gardens of Istanbaal to the dirt and bloody soaked sands of Aegypt the Sultan rules over many millions. While Urop is far off there are those among the Othari who wish to become more like them. From the Janissaries who have become the ‘new model army’ to merchants who sell the fashions of Londinium and Lyonesse. A son of a wealthy Istanbaal cloth seller Yani Otharan begged his father for enough gold to travel to Urop and to see for himself the places of soot, smoke and mighty ships. With an agreement and an promise to return to his family in two years time Yani set out from the Blaake Seafor Ostaria to begin his tour. With little experience of the world outside of his home city and equipped with a lot of coin and an idea of how a ‘gentleorc’ behaves it was not long until Yani became a real fop. After coming near being robbed he hired an entourage of Dogmen as guides and protectors. Yani Otharan is now on his way to Venna the capital of Ostaria and hopes, despite his guides pleas not to, to meet the Emperor Klaffenhund. 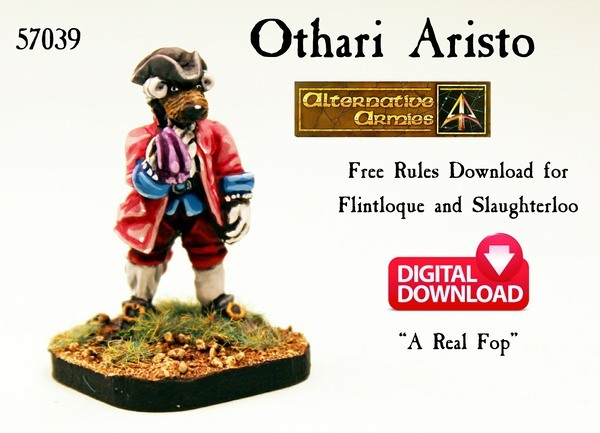 The Othari Aristo has attracted a lot of attention with his generous tipping of anyone who crosses his path. There may be a full scale riot! 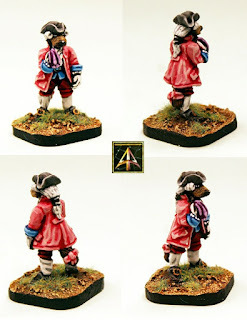 This code contains one 28mm scale white metal miniature which stands about 28mm tall. A wealthy Othari in fine clothes with tricorne hat and lace hankerchief. 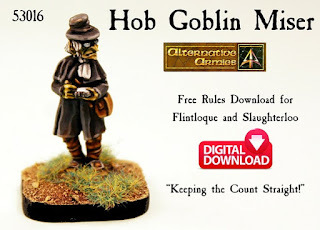 This miniature works well in many game systems in High Fantasy and of course Flintloque and Slaughterloo. Goes excellently with the Othermann Empyre range plus Valon Civilians. You can purchase this code unpainted or painted and based for immediate play. Supplied with a 25mm square base. Price 2.00GBP. Go HERE. 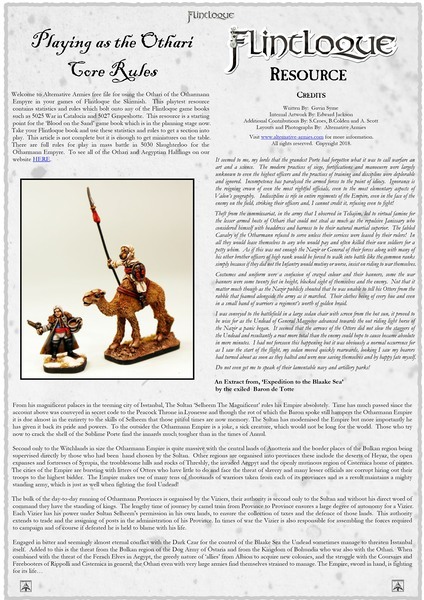 We have created a one page article called 'A Real Fop' which contains a short tale, rules for Flintloque, rules for Slaughterloo as well as a scenario seed which is hosted on our website as a PDF; click HERE to download it to your device. Excellent! 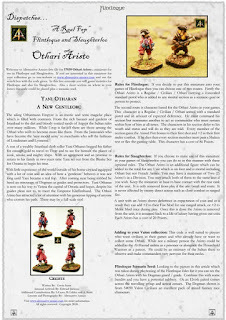 A free Flintloque resource to download from our Website on the Otharmann Empyre page HERE. Four pages giving you an introductory background plus racial tables and unique rules plus notes for getting Othari and Aegyptian Halflings into your games. 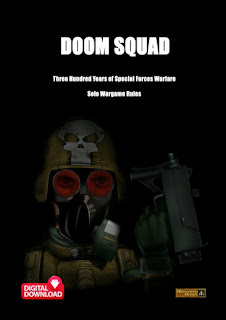 It is a playtest official document for which you will need to add any game book for 3rd edition or the 5024 Escape the Dark Czar beginners box set to get the rules to get the figures on the table. It is a bolt on article. So if you have Janissaries, Household Warriors, Camelry and other Othari troops this is an article for you as we test things out for 'Blood on the Sand'. 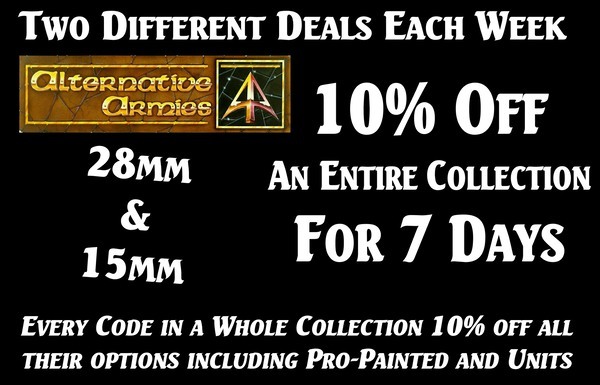 Each week we present TWO entire collections (parts or a whole smaller range) with 10% off the price of every miniature, book, accessory, limited code and everything else in that collection. This discount applies on top of those already in place for bumper packs, units and so on. It also applies to pro-painted options too. 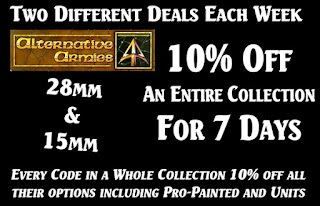 A 28mm scale deal and a 15mm scale deal across our Flintloque / High Fantasy / Science Fiction / Historical genres. They are all listed on the page together. Deals end at Midnight GMT Sunday each Week. Start a new army or fill in gaps in your force. Test out a new collection or sample for skirmish. Go HERE. We recommend you check once a week to see if something you want has appeared in the deals. If you have not already done so we urge you to go to our website home page, scroll to the bottom and join our mailing list through the box provided there. You will not miss out on all the new releases and fun plus we sometimes have email list only events. 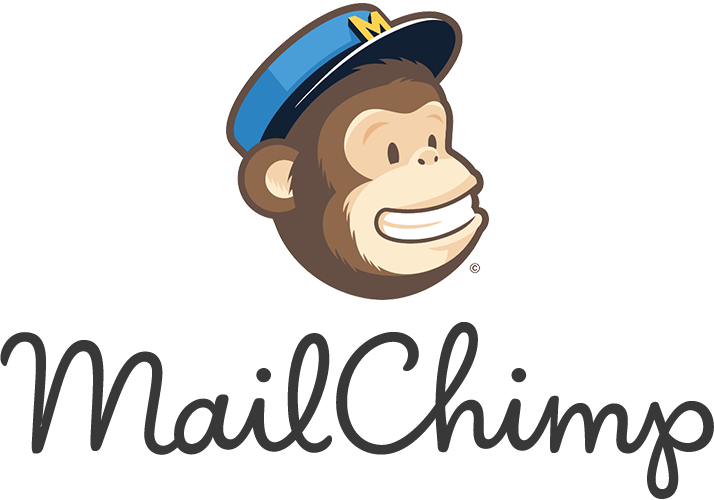 We send out one email a week typically at the start of a new week.